Kathleen Kelly: What will NY152 say today, I wonder. I turn on my computer. I wait impatiently as it connects. I go online, and my breath catches in my chest until I hear three little words: You've got mail. I hear nothing. Not even a sound on the streets of New York, just the beating of my own heart. I have mail. From you. 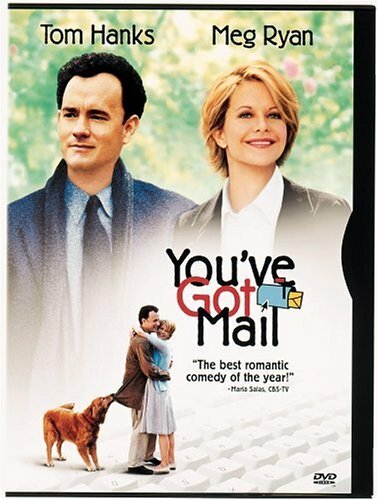 You’ve Got Mail is a timeless romantic comedy written by the wonderful Nora Ephron. Meg Ryan plays an independent bookstore owner, and Tom Hanks plays the owner of a large bookstore chain. They don’t like each other in person, but they unknowingly chat with each other over the internet, where they find themselves flirting and sharing tidbits about their days or lives. It’s a stereotypical movie love story, so you already know how it ends. Kathleen Kelly (Meg Ryan) is the sweet owner of a children’s bookstore, which she inherited from her mother. She’s in a relationship with a news reporter who is always looking for the success of the underdog - and, oftentimes, cares more about the story than anything else. Joe Fox (Tom Hanks) is the savvy owner of the Fox Books bookstore chain (think Barnes and Noble, or Borders). He’s in a relationship with a snobby, egocentric girlfriend who cares only about money and appearances. As Kathleen and Joe meet and chat online, they begin to fall in love. It’s when they plan to meet, of course, that things begin to go awry. This movie is also a interesting reflection of our society. It’s so easy to be whoever you want to be behind the keyboard and computer screen. No one has to know what you look like, or how you act in real life. Your online persona can be completely different from who you really are. It’s how you reconcile the differences that is important. It’s also good to think about how you interact with the people around you in your everyday life. We all need a moment, now and again, to be thankful for the people we choose to share our lives with - or who choose to share theirs with us. The wonderful thing about this movie is its dialogue. From Tom Hanks’ pithy one-liners and sarcasm, to Meg Ryan’s sweet sincerity and awkward attempts to stand up for herself, this movie appeals to everyone. Viewers of all personality types can find someone to relate to in this movie, which makes it all the easier to slide into the moment and enjoy it, despite its predictability. But really, if you’re watching a romantic comedy in the first place, do you really care much about predictability? Another bonus for movie and book buffs: one could make the argument that this movie is an homage or modern retelling of Pride and Prejudice, with Joe as Mr. Darcy and Kathleen as Elizabeth. Why I Like This Movie: It’s so easy for me to identify with Meg Ryan’s character. In fact, I’ve said, done, and felt a lot of the things she did in the movie. Sometimes it’s just nice to believe that everything will work out just fine, and I’m a total sucker for happy endings. Why You Should Give This Movie a Shot: Everyone needs a dose of happy endings in their lives every now and again. And in the digital age we currently live and work in, this movie certainly is relatable.